The new face of resilience. Like all pewag elements, this stainless steel eye sling hook is the result of a sophisticated manufacturing process. Using highgrade stainless steel, the hook is drop-forged and stamped. The compact design of the hook ensures the highest possible load capacity while maintaining a minimum product weight. 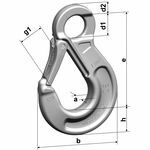 The hook provides impact for protection for the safety catch, a large hook mouth and an extra-wide hook point to prevent accidental hooking into the chain. Due to the flat section on the eye, the hook is also compatible with alternative connecting systems. This eye sling hook provides excellent directional stability and perfect guidance of the safety trap. It is particularly suited for the assembly of welded and assembled rope lashings. The safety catch engages with the hook point, which provides an effective protection against lateral movements. Forged inspection marks that facilitate the visual recognition of the discard criteria complete this outstanding product. The manufacturing process is similar to EN 1677‑2. The stamp and the CE-mark ensure that the product is clearly identifiable. The safety catch assembly is available as spare part SFGWI. Preferred areas of application are (sea-)water and wastewater applications and the product can also be used in connection with chemicals and food products; however, restrictions will apply.